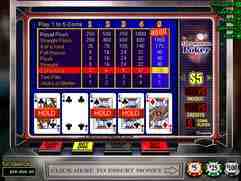 All American is an innovative version of video poker offered at online casinos powered by RTG technology. The game has the aggressive innovation of being able to draw across multi-draws. In fact you can draw for 100 separate hands! So you have multiplied chances for those big draws and more chances of taking home the big win. Being able to make so many draws makes it one of the most exciting versions of Video Poker out there. Sometimes you can be waiting for hours for that perfect chance for the Royal Flush only to miss. With RTG All American, when you finally get 4 cards to the Royal Flush you will have 100 shots at completing it! You’ll even be able to complete hands like 3 cards to the Royal Flush. Suddenly it won’t be such long waits between drinks! The other big draw for All American is when you hit completed big hands before the draw, like full houses or 4 of a kind. This is because instead of just being paid once for the hand, you’ll be able to get paid 100 times!! So with RTG All American when you do hit the big hands, you’ll be paid enormously more than on a regular video poker machine. On top of that, you’ll be hitting those big hands so much more often. Come see what RTG All American is about, check it out at one of our recommended RTG online Casinos today! Silver Oak Casino is without a doubt one of the most popular flash powered sites. They use RTG software to power their online casino games and they have hundreds to choose from; including slots, video poker, blackjack, and more. The thing we like most about Silver Oak Casino is that they are currently giving away up to $10,000 in free bonus money to all of their new players, so head over to their website today to take advantage of this great offer while you still can! Bodog Casino has been in the business for 15 years and its easy to understand why so many players have been raving about them. They are fast with their payouts and 75+ games to choose from, we know you will love Bodog too ! Try them today and receive a 10% bonus on your first $30 deposit. Bodog is also famour for their poker and sports betting and addition bonuses are available for these. One of the best places to play All American video poker online is at Silver Oak Casino! That’s because they are currently offering all new players a chance to collect up to $10,000 in free video poker money when you make your first deposit! This is a great offer from an even greater casino, so get in on the action today and start playing All American video poker at Silver Oak Casino! You can play All American video poker and just about every video poker machine you can think of at the wildly popular Slots Plus Casino! This RTG powered online casino has one of the largest collections of video poker games you can find online and they also have a terrific video poker bonus for all new players! At the moment, when you make your first deposit, you can get a 400% bonus worth up to $3,000 in free casino money to use on the All American video poker game at Slots Plus Casino! We always recommend Vegas Casino Online to the visitors of our website because they have one of the biggest video poker bonuses available online! For a limited time, you can get a whopping $5,000 video poker bonus when you make your first deposit at this reputable online casino! This free video poker money will give your bankroll and instant boost and will allow you to increase your wagers so that you can go for bigger wins! Simply visit the Vegas Casino Online website today to take advantage of this great offer! Manhattan Slots Casino is one of the newest RTG powered online casinos and to help celebrate their recent launch they are currently offering the visitors of our website an exclusive $25 free casino bonus with no deposit required! Simply redeem the bonus code 25CBG and your account will instantly be credited with $25 that you can use to play RTG All American video poker or any of the other great games at Manhattan Slots Casino! Aladdin's Gold Casino is a prestigious RTG powered online casino that we proudly recommend to all of our website visitors. They have hundreds of real money online casino games to choose from; including the always popular RTG All American video poker! At the moment, when you redeem the bonus code 25CBG, you’ll get $25 in free casino money with no deposit required at Aladdin's Gold Casino! New players at Aladdin's Gold Casino, a reputable RTG powered online casino, can get $25 in free casino money with no deposit required by redeeming our special bonus code 25CBG! Plus, when you’re ready to start playing for real money, you’ll be eligible for up to $8,000 in additional bonuses when you make your first deposit! Try out Aladdin's Gold Casino today and be sure to try a few hands of their popular RTG All American video poker! Planet7 Casino is an exciting new online casino that is powered by RTG (Real Time Gaming) software. They have the entire suite of RTG games available; including RTG All American video poker! Right now, new players at this reputable online casino can try their games out for free by taking advantage of the $25 no deposit bonus that they are offering our website visitors! Just redeem the bonus code 25CBG and your account will instantly be credited with this free bonus at Planet7 Casino! iNetBet Casino, a leading RTG powered online casino, is currently offering all new players from our website an exclusive $10 no deposit casino bonus! To get your free bonus, simply redeem the bonus code CBG10 in the casino cashier and your account will instantly be credited with $10 in free casino money! You can use this bonus to play RTG All American video poker or any of the other real money casino games available at iNetBet Casino! If you’re looking for a fun place to play RTG All American video poker, you’ll definitely want to check out Slots Plus Casino. Slots Plus Casino is a popular RTG powered online casino that is known for offering some of the best video poker bonuses available online. For example, all new players who make their first deposit will be eligible to receive a 400% bonus worth up to $4,000 in free casino money at Slots Plus Casino! Aladdin’s Gold Casino is currently running an unheard of new player promotion that you’ll definitely want to be a part of! For a limited time only, all new players at this RTG powered online casino will be eligible to receive an UNLIMITED amount of bonuses for their first 7-days as a new player! That’s right; you can get an unlimited amount of bonuses on each and every deposit you make and you can use your bonus money to play RTG All American video poker or any of the other great games at Aladdin’s Gold Casino!